The Warehouse District's premier dance club. The Velvet Dog offers downtown atmosphere that's drenched in sweeping colors, lively remix and Top-40 dance sounds. Our upscale first floor surroundings are a prime location for pulsating crowds with a newly renovated high- technology look and feel. There's dazzling martinis at our low-lit Third-Level Lounge and a sparkling view of downtown on our outdoor rooftop patio. All you need to do is relax, get comfortable and enjoy the Warehouse District's legendary location of wild style - the Velvet Dog. The century-old bank vaults beneath the Cleveland Trust Rotunda will soon be home to an upscale, hand-crafted cocktail lounge. Enjoy over 30 hand-crafted cocktails fashioned by resident mixologists, small plate menu offerings and exceptional service in Cleveland's premium cocktail lounge. Liquid is Cleveland's oldest bar and nightclub. After 21 years, you can say we know how to throw a party. 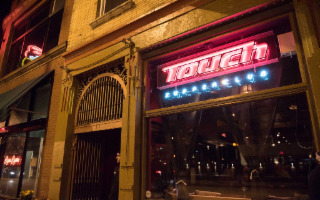 Touch Supper Club has offered Clevelanders a unique dining experience featuring cuisine as eclectic as its live entertainment. Gourmet pizzas, sliders, mac & cheese and other comfort foods nestle up to fresh steaks, seafood and salads. DJs from around the world offer patrons the opportunity to dance to the sounds of Salsa, Afrobeat, Classic Hip Hop, Funk, Soul, Disco, Electronic Dance Music and more in our quaint basement club.